THE STORY - In 1970s Mexico City, two domestic workers help a mother of four while her husband is away for an extended period of time. THE GOOD - A complete film. A captivating exercise in form and an emotionally powerful story that will resonate at any point in time. Builds off the techniques and concerns of neorealism and other cinematic heavyweights, but also largely inventive and one-of-a-kind. A beautiful performance by Yalitza Aparicio. THE BAD - Might feel emotionally distant to some, as it lacks a straight-forward plot, conflict, or resolution. ​​​​​It would be difficult to recommend something akin to Alfonso Cuarón’s latest film-- his first collaboration with Netflix studios, and yet a strangely un-commercial film, unlike anything he’s made thus far. With “Roma,” Cuarón seems to have taken a path all his own. The director of “Children Of Men” and “Gravity” has been a staple of Hollywood for well over a decade now, but unlike the other two-thirds of the Three Amigos (Guillermo Del Toro, Alejandro González Iñárritu), he has chosen to turn his attention back to his home country, specifically to his childhood neighborhood, the bustling, concrete-paved commercial streets of Colonia Roma in Mexico City. But then, neither does “Roma” lean in the same direction as other internationally-lauded Mexican films by festival regulars like Carlos Reygadas and Amat Escalante, who are often uninterested or patronizing of Mexico’s lowest rungs of society. Instead, Cuarón’s first professedly autobiographical film draws comparisons to Italian neorealism, with its cast of nearly all unprofessional actors and a story that revolves around an indigenous woman working as a domestic servant. Yet there is nothing derivative about this work. 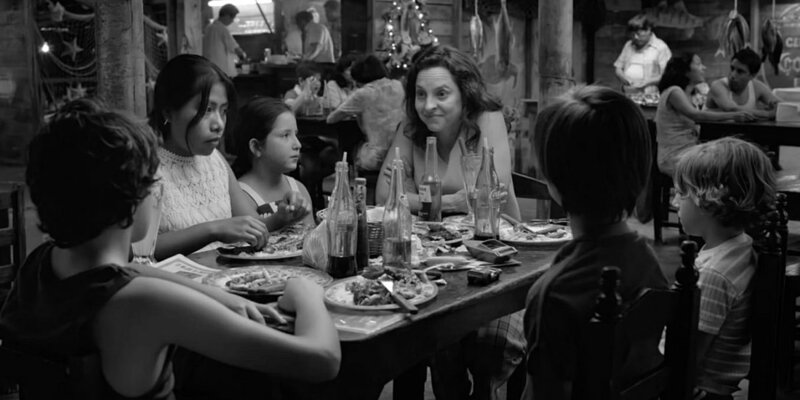 "Roma" is irreducibly Cuarón's vision, quite tangibly at times, in a way that makes it feel as if we are bearing witness to particular memories as they float up to the surface. Armed with Netflix production muscle, Cuarón and his team virtually reconstruct a more affluent part of Mexico City circa 1971, with its budding parks, shiny new movie theaters, and jumbled traffic. But this is no city symphony -- Cuarón keeps audiences close to the ground, on the heels of the inauspicious Cleo (Yaritza Aparicio), the handmaid and nurse of a large upper-middle-class family. The opening shot of the film, the same image used for the cryptic teaser released earlier this summer, shows a tiled floor washed over with soapy water, the regular movement of a domestic task like mopping akin to the beat of ocean waves lapping ashore. The reflection of an airplane overhead is briefly captured by the puddle, like a glimpse of the urban exterior peeking in, and history-making itself known on the terrain of the seemingly mundane. But even when the camera might be tempted to take this particularly interesting historical moment, of tumultuous social upheaval and government abuse, as its focus, Cleo steadfastly remains the protagonist of the film, her story privileged over a more seductively political-historical drama. Instead, the student uprisings of 1971 and the infamous Corpus Christi massacre, are seen from Cleo’s point of view, blended into her individual story. In one scene, in particular, we witness a violent protest from the window view of a furniture store, where Cleo is shopping for a baby crib. Moments like these, somehow both restrained and immersive, underscore the film’s radical empathy, and its masterful exposition of macro-level events by way of a micro-cosmic cinematic vision. Cleo is Yalitza Aparicio’s first role, but despite never having acted (in fact, she was educated to be a school teacher), Aparicio occupies her character so fully that the two people seem indistinguishable. Hers is a relatively reserved performance, bathed in silence, and yet teeming with passion, suffering, joy, and regret that need not be expressed in words. The camera often settles on her face with a sort of adoration, as if it has resolved to pay heed, once and for all. Audiences looking for a straightforward narrative with conflicts and resolutions will be disappointed, as Cuarón’s humanist drama is more concerned with offering a stream-of-consciousness vision of life, and insight into Mexican culture as experienced by a member of one of the bottom tiers of Mexican society. Real historical events inevitably filter in, but Cleo’s life-- her domestic role in the family, her romantic difficulties, her moral dilemmas-- paint a remarkable picture of machismo, motherhood, and the modern day remnants of Mexico’s colonial caste system. Plot description here feels beside the point. That Cuarón shot “Roma” himself is an impressive feat and a testament, not only to the director’s technical prowess but to a deep sense of love and recognition for the women in his life, perhaps even born of revisionist impulses. In one climactic scene towards the end of the film, Cleo is embraced by the family she serves-- the children, her madam-- after a near-fatal incident involving one of the children. Preceded by a long tracking shot as Cleo makes her way into an ocean-- a simple technique elevated to great emotional effect-- the embrace back ashore feels tableau-d, captured with the same epic dignity of a great Renaissance painting. In some instances, particularly when exploring Cleo’s workplace slash home -- I concede that the film occasionally explores space with the observational eye of a museum tour, which might leave some viewers cold in the way physical art is often dispassionately admired. I had the distinct pleasure of watching “Roma” on the big screen prior to its upcoming December release on Netflix’s streaming platform. Word is abuzz of a potential theatrical run, which should, of course, quell many a film enthusiast appalled at the notion of confining Cuarón’s latest work to the small-screens of home streaming. “Roma” is one of the most significant works I’ve seen in recent years, and with this work, Cuarón is destined to join the ranks of the great film auteurs of history-- Kubrick, Denis, Renoir. But this story-- of a young Latina woman in an environment and situation so inadequately depicted in Hollywood-- needs to be shared. Netflix might just be the most effective way to do that.